When I was growing up, whenever someone had a baby, my grandmother would make a pot of fish stew before heading over to visit. It smelled wonderful, with all the ginger, scallions and herbs in the broth. It turns out that seafood promotes lactation and the herbal soup helps to rebuild the new mother’s body. Nowadays, I carry on the tradition in my own small way. 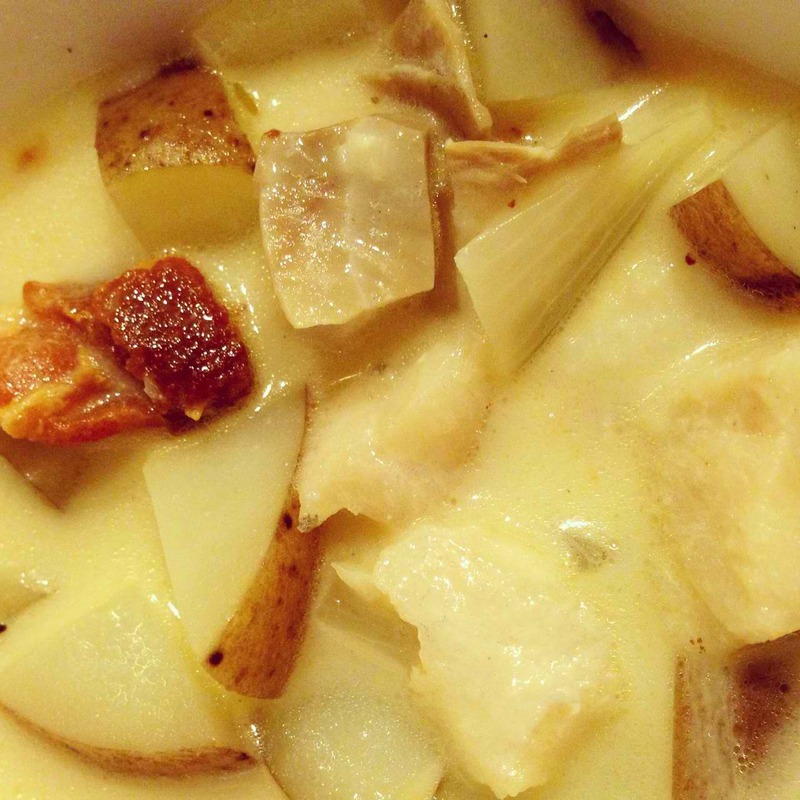 When someone I know has had a baby, I make my version of New England style fish chowder for the new mom. It’s rich, delicious, easy to make and to reheat. It also travels well in those plastic takeout containers. One of my acu-babies will be born this month and we’re using acupuncture to give him a little nudge. (I heard his mom got contractions last night!) I thought this is as good a time as any to share the recipe. It’s very forgiving, so feel free to tweak to your taste. It’s not exactly my grandmother’s fish stew, but it uses ingredients available locally (but if you want to use fish head and a miso base, go right ahead!). Fry the bacon until crisp and the fat renders. Take the bacon bits out and put them on a plate lined with a paper towel. Saute the onions in the bacon fat until softened. Add the flour and cook until the onions are well-coated and the flour is lightly-colored, about 1 minute. Add the wine and 1/2 cup of stock, stirring until the liquid is thick. Gradually add the rest of the stock and scrape up the yummy brown bits at the bottom of the pan. Stir in the cream, potatoes, thyme, bay leaves, plus salt and pepper to taste. Bring everything to a boil, then simmer on medium-low heat until the potatoes are almost tender, about 15 minutes. Add the fish and simmer for 7 minutes, stirring a few times to make sure the fish is evenly cooked. Remove the pot from heat, discard the bay leaves, and stir in the bacon bits and parsley. Add more salt and pepper if needed. Enjoy!